Peacocks symbolize dignity and assurance in Asian lore. Here two stunning peacocks meet each other in this elaborate and masterful piece. Peacocks symbolize dignity and assurance in Asian lore. Here two stunning peacocks come face-to-face in this elaborate and masterful work of art. Entirely hand-painted, this wall fan features multicolored peacocks surrounded by a vast array of bluish and white flowers. Some Chinese believe the peacock to be the manifestation of the phoenix in earthly form. The eyes on the peacocks tail feathers are said to create good luck, fame and inspire positive motives and outcomes. During the Ming Dynasty (1368-1644 AD) , the peacock was the primary symbol of the Chinese elite. They equated the peacock with power, divinity and beauty. The magnificent peacock is also associated with the Chinese goddess Kwan Yin. Chinese mythology asserts that when Kwan Yin decided to ascend to the heavens from earth she appointed a guardian to keep the peace on the planet. She then summoned a bird with plain brown feathers to take her to the heavens. Kwan Yin then rubbed her hand down the length of the peacock&apos;s back and the dull brown feathers changed to an array of beautiful colors. Some scholars believe this was Kwan Yin&apos;s way of showing compassion and showing that she is continuously watching over the world. In the Christian religion, the peacock represents immortality, renewal and resurrection. These attributes are suggestive of the traits associated with the phoenix, which the peacock is said to be in earthly form. In Hinduism, the peacock also holds an important place and is associated with the deity Lakshmi. Whether you believe mythology, or just love the peacock for its pure beauty, this inspiring Chinese wall fan is certain to enhance any spot it is hung. The black background of the fan makes it easy to fit into almost any color scheme. Choose from two sizes and order the optional black stand if you are looking to place the fan on a table or flat surface. You're viewing our 40-inch Meeting of the Peacocks Chinese wall fan also available in the 60 inch width size. 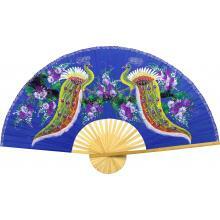 This fan is all hand-painted and it features two brilliant peacocks opposing each other in the classic Chinese style. You can see the wild flowers all around the peacocks, and the peacocks are very intricately painted in extreme detail. And here, as I point out, you can see some of the brushwork and art that goes into the peacocks and the flowers. And that's an all black background. The fan is made of a rayon fabric and that's a bamboo frame I'm pointing to. The paint on the fan is acrylic. Peacocks are one of the most important birds in Asian art, right behind the cranes and the Phoenix. Here you can get a closer detail of the peacocks. It's just a gorgeous fan will make superb decoration on any wall.